BEACON FALLS — The Greyhounds continued to roll as they invaded the Hawks Nest on Tuesday and came away with sweep over Woodland to earn their eighth — six by shutouts —win in a row. 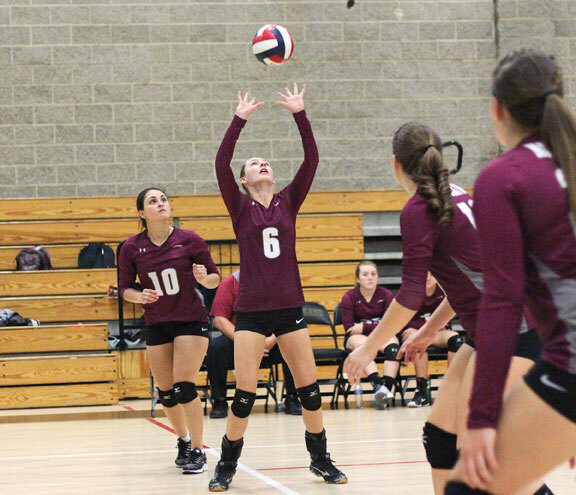 Naugatuck improved to 12-4 with the 3-0 (25-22, 25-22 and 25-9) win over the Hawks. 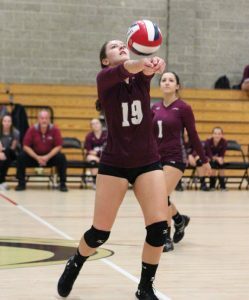 Cailee Bergin (13 points, 9 assists, 6 kills) and Aryana Powell (12 points, 6 kills, 4 aces) led the way for Naugatuck. Powell rattled off a 10-point run in serve as Naugy exploded to an 11-1 lead in game three to pave the way for the sweep. Naugatuck’s last loss came Sept. 26 to Seymour. Since then, the Greyhounds have played with confidence and focus. That was displayed throughout the match against Woodland but really took hold in game three. Bergin went up at the net and was blocked by Woodland’s Lexi Chabot. Before the ball had a chance to hit the floor, Julia Pelliccia (3 kills) charged over to keep it alive. Brielle Behuniak (8 assists, 4 kills) set up the return, and Bergin placed the kill to the far corner of the back row. Woodland was pulling out all the stops, and Steph Krebbs let go of a blast that Powell somehow fended off. The ball careened out of bounds, but Hailey Deitelbaum (4 kills) gave chase and sent the ball to the net. Bergin tried to sneak it past a pair of Woodland defenders at the net, but the Hawks fought it off. On the return, Deitelbaum charged the net and hammered a kill at the feet of the middle row players to make it a 10-1 lead in game three. The Greyhounds opened a 17-7 lead in game one with Jayla Piazza (8 points, 9 digs) guarding the back row. Woodland showed tenacity and battled back to cut the deficit to 18-16. Sometimes it pays to be a little lucky. Bergin stepped into serve and drilled it into the top of the net. As Woodland celebrated the misfortune, the ball took an odd spin and wound up falling on the Hawks’ side of the court. Naugy went on to win game one, 25-22. Naugatuck and Woodland went back and forth in game two. Tied at 12-12, Bergin fired a side out kill and then stepped into serve to build a 20-15 lead. Woodland had one more push left and tied the match at 20-20. Powell delivered a side out kill, and Piazza stepped in to serve and closed out the 25-22 win to take a 2-0 advantage. The Greyhounds face a stiff test on Thursday against Seymour, the last team to hand them a loss. On Friday, the Greyhounds return home to face Wolcott, a team they dropped a tough 3-2 match with earlier in the season.